When Mr. Smith rescues a tiny gray kitten stranded in his old oak tree, he has no idea how his life is about to change. Lonely since the passing of his wife, Mr. Smith blossoms under the loving care and attention of the devoted new friend he names Miss Marvin. But life has it ups and downs. After a fall, he and Miss Marvin learn they must leave their beloved house, their stately oak tree, and the tire swing in the shady back yard for a new home in an assisted living facility. Afraid of leaving his memories behind, Mr. Smith soon learns through the eyes of Miss Marvin that many wonderful experiences lie ahead. 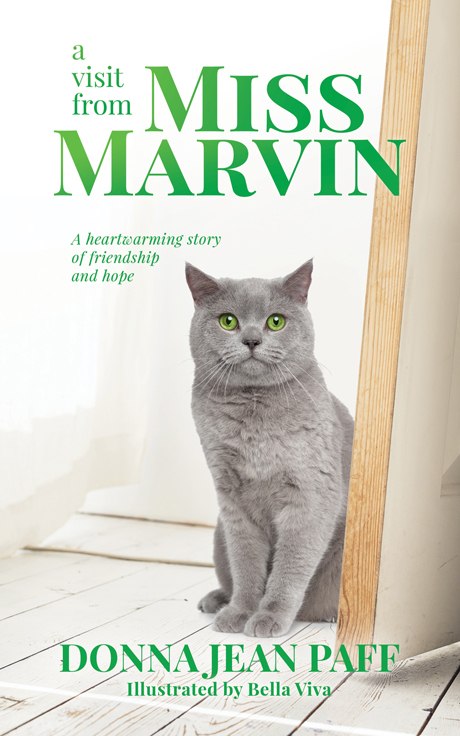 A Visit from Miss Marvin is a book for all ages. Children, adults, and seniors will learn there is joy in every stage of life, and that every new beginning is truly a blessing. Donna Jean Paff owned and operated a business in southeastern Pennsylvania for ten years. She also held positions in clerical and staffing at Wernersville State Hospital, and served as an energy therapist for seniors in assisted living. As a volunteer, she worked at the Berks History Center cataloging artifacts and arranging local history tours for seniors in assisted living, participated in a clinical study in integrative healthcare at St. Joseph Hospital in Reading, and performed various duties for Berks Parks and Recreation and the Reading Public Museum. Now retired, Donna loves to spend time with her family and friends. She also enjoys reading nonfiction, writing, and helping out local seniors whenever she can. She has a great appreciation for natural remedies, local history, and genealogy. Her book, A Visit From Miss Marvin, is based on a true story inspired by one of the many senior citizens that Donna has come to know and appreciate.